Believe it or not, making pizza dough is a rather sensual experience. Rather than seeing it as a chore and deciding to pop out to buy a packet of the ready-made variety, it is worth persevering because the rolling up of the sleeves and working the mixture with your fingers can be very rewarding. There is also the satisfaction from knowing that the light and crispy base your guests are tucking into was made with your own fair hands. You will know when you have pulled it off because they will never believe that you made it yourself. All that is required is a few simple ingredients, a large bowl and setting aside a few minutes to complete the process. For purposes of the recipe, the quantities given are sufficient for producing the base for two plate size pizzas. Strong white bread flour is widely available in supermarkets and is ideally suited for making the dough. The Italian doppio zero flour also works a treat but is not essential. Pour 400 grams of the flour into a large bowl, add a couple of grinds of the salt mill and the contents of a packet of dried active yeast. Run your fingers through the flour to ensure that the three ingredients are evenly distributed, then add 250 millilitres of water which should be lukewarm in order to promote the action of the yeast. Now here's the sensual bit. Start bringing the flour and water mixture together with your fingers. As it begins to bind and become a single mass, add a couple of drops of extra virgin olive oil and a drop of milk. The latter will bring mellowness to the finished taste. Continue working until the dough is thoroughly combined and smooth on the outside. If it continues to be slack, or wet, simply add a little more flour until the required consistency is reached. The dough should now be sitting free of the sides of the bowl. Take it out, pour in a little more oil and use your fingers to create an oily lining on the inside. Then drop the dough in and turn it several times to coat the outside in oil. This will prevent a crust forming on the top of the dough as it rises. Place the bowl in a warm part of the kitchen, for example in an unlit oven, and leave for two to three hours. The dough should now have doubled in size. Punch it down to remove some of the air, then transfer to a floured surface and begin working, using the heel of your hand to push down on it and the palms to roll it. The dough should spring back as you work it. 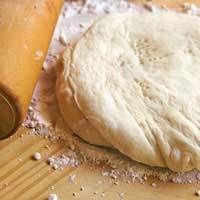 Cut the dough into two, reflour the surface and taking each dough ball in turn, working it into the required shape using a rolling pin. The shape of the finished pizza base is a matter of choice, although it should be dictated by the shape and width of the baking tray or stone that you are going to use. Place the base on the tray and allow it to rise for a further 30 minutes. Now you have the perfect foundation for creating whatever combination of flavours you desire to adorn your pizza.